Today a hope is risen for those who have lost it. Today those rejoice who gave their lives for their own people and homeland. Today we understand that slogan “Heroes don’t die” means nothing but a paschal song of Ukrainian people on their way of following Christ. Father and Head of Ukrainian Greek Catholic Church His Beatitude Sviatoslav said it in his homily on the Day of Resurrection of Christ on 16th of April 2017 at Patriarchal Cathedral of Resurrection of Christ in Kyiv. 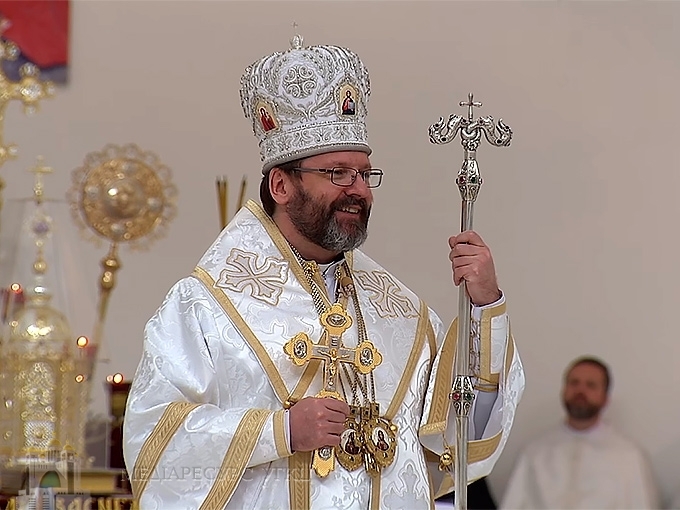 Bishop Bohdan Dziurakh, Secretary of the Synod of Bishops of UGCC, bishop Josef Milian, Bishop-auxiliary of Kyiv Archeparchy and priests of Kyiv Archeparchy co-served His Beatitude Sviatoslav during the Liturgy. Describing this day, Head explained that today we are celebrating the greatest, the most important holiday of all, a feast of feasts – Resurrection of Christ. “This Paschal holiday is a holiday of a transformation, a holiday of a transfer, emergence from a reality related to pain, suffering, weakness of a human, sin and death. It is a holiday of entering an absolutely different reality related to brightness, life, happiness, peace and joy, what is endless”, the Archbishop said. Head of Church marked that this Pasch we experience changes in a special way here in our Patriarchal Cathedral in Kyiv, what is a cathedral of Resurrection of Christ. And during exactly these days we celebrate its parish festival. His Beatitude Sviatoslav assumes that today, thinking about Resurrection of Christ, we understand that the last word in a human’s history doesn’t belong to the human and their malice, neither to a sin, nor to a death. The last word goes to God only. The last word takes a resurrected Christ. A life, not a death. “Risen from a grave, Jesus Christ tells us: there are no desperate situations, I am your way out. Christ is our way, the one who open new doors before us. He is our way, truth and life”, Head of Church asks everyone to think carefully about it. “Today we are singing a song of Christ, the triumpher over sin and death, so we feel we can cultivate a life where somebody cultivates death; build where somebody destroys. We feel we have enough strength to change, reform, give a new life and breath to our country when some want to reckon us it is impossible. “Nothing is impossible to those who believe”, Jesus Christ says. We see that today for the one who believes in Resurrection, there are no boundaries or reasons for mourning over the impasses”, the preacher assured. On this full of joy and optimism festive day, His Beatitude Sviatoslav congratulated everybody. “When we congratulate each other, saying “Christ is risen”, we spread this life strength we get from a resurrected Christ”, added a spiritual leader of Greek Catholics. He congratulated people all over Ukraine and abroad. He congratulated our migrant workers who seek an honest bread beyond their own country. Our brothers and sisters from the occupied territories and Crimea coast, hostages and captives were also congratulated. “Christ is your Rescuer, be sure”, Head of Church said. ‘I am sending my paschal greetings to our government, and I am saying you: don’t be sad, don’t lose faith. Those good intentions and reforms you are starting God will support. Corruption, the old system and everything what prevents Ukraine from being free democratic European state is possible to conquer”, His Beatitude Sviatoslav assured. “I am sending my paschal greetings to our soldiers who are defending our Pasch, who consume Paschal food in trenches at the frontline, who see death with their own eyes every day. And I am telling you: believe in Resurrection, be not the bearers of death, but life and resurrection, since you defend it and give your life for it”, Head of Church appealed to our soldiers and added that what we are mostly asking our resurrected Savior about is to grant paschal peace to our land”.